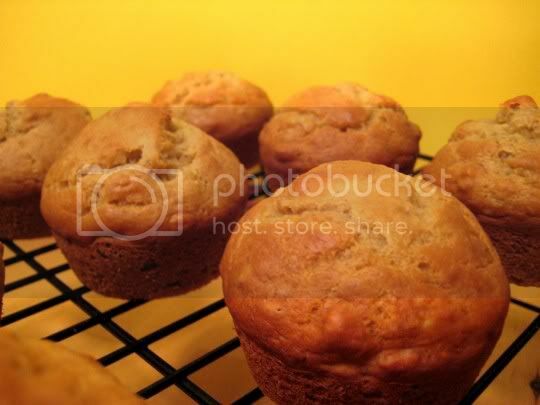 Mmmm, there's nothing better than moist, soft, fresh-from-the-oven banana muffins in the morning! And these are sure winners, chockful of banana flavor, crunchy walnuts, and maple-y goodness. The recipe uses your standard wet-into-dry ingredients method, so it's super easy and quick to make. Butter is actually cut into the flour mixture first, which will give the finished muffins a wonderful richness and moistness (not to mention the buttermilk added for liquid). The only sweetener used (other than the overly ripe banana) is pure maple syrup, which gives the muffins a sophisticated and healthy-tasting sweetness. Usually, I omit nuts from my baked goods recipes, but I almost think the muffins would have been missing something without them. The walnuts add to the texture and flavor, but without being overpowering. Serve these with coffee, or for a full breakfast with cottage cheese, fruit, and juice on the side. Make again? Yes, a good, solid banana-nut recipe. This would probably be good as bread too.